Wellington Webb was born in Chicago in 1941. He came to Denver at a very early age and before entering politics he was a forklift operator. Webb’s public service career began in 1972 when he was elected to the Colorado House of Representatives. In 1977, he was selected by President James Carter to serve as regional director of the U.S. Department of Health, Education and Welfare. Then in 1981, Colorado Governor Richard Lamm appointed Webb to his cabinet as Executive Director of the Colorado Department of Regulatory Agencies. In 1987, he was elected as the Denver City Auditor. 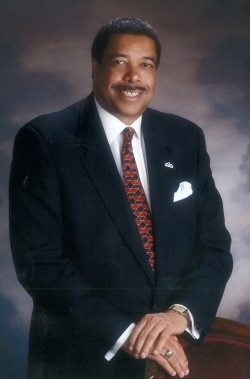 In 1991, Webb became the first African American mayor of Denver. He won reelection twice, serving a total of twelve years. During his tenure he named the first Hispanic police chief, the first African American fire chief and the first Hispanic Clerk and Recorder. He also oversaw the construction of Denver International Airport and ensured that many of its concessions would be operated b women and minority entrepreneurs. Mayor Webb hosted nearly 200,000 people from around the world to celebrate World Youth Day with Pope John Paul II on August 11-15, 1993, and in 1997 welcomed President Clinton and eight world leaders at the Denver Summit of the Eight, the annual economic summit. A new city office building was named the Wellington E. Webb Municipal Office Building in 2002 just before he left office. In addition, Denver Health and Hospitals named their primary care facility in his honor in 2006. Since leaving office, former Mayor Webb has partnered with a real estate developer to build affordable housing. Wallace Yvonne Tollette, Colorado Black Leadership Profiles (Denver: Western Images Publications, 2001); Wellington E. Webb: A Tribute to 12 Years. (A Commemorative Booklet), Urban Spectrum Newspaper, 2003.